Fragbox is really proud to present a new and exciting way to buy and grow corals. FCC™ stands for Fragbox Cultured Corals. Any piece with this designation means that was grown in our coral farm program here in Canada. 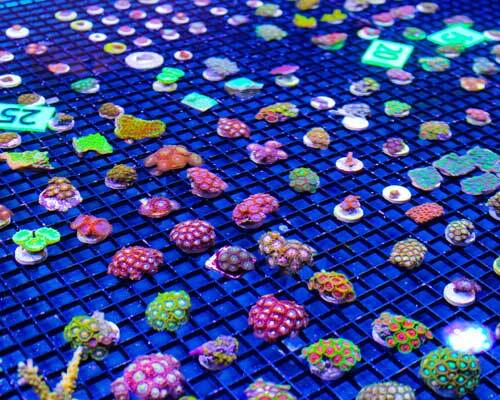 What are the benefits of cultured corals ? They have a small or near 0 environmental impact. Rather than taking corals from the ocean they are grown and fragged from existing colonies here in Canada. This reduces the importation and stress of existing reefs by utilizing coral colonies already present here. By successfully growing them in our farm, it means that your chance of also successfully growing them is much higher as we have already proved that the certain species is able to be grown in captivity. We are all citizens of the planet and all responsible for the oceans, By choosing to buy cultured corals at Fragbox you can help us grow our farm and further reduce environmental impact. Our goal is one day we will not have to use the FCC™ designation as all of the corals we provide our customers will be grown within Canada.